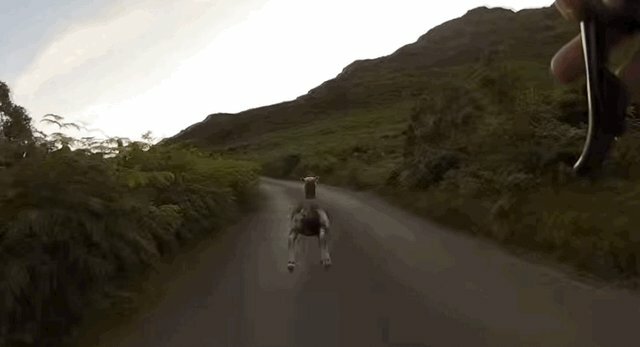 What started out as a pleasant bike ride through the countryside quickly turned into a test of speed and endurance for one cyclist after a lone sheep, who'd just been hanging out in the roadway, decided to challenge them to a street race. The impromptu interspecies competition, however, ended poorly for the fast, but-not-fast-enough human participant, as the fleeced creature widened his lead for an easy win. While sheep aren't generally thought of as a speedy species, they are more than capable of being fleet-footed when the moment calls for it. Police in Germany learned that lesson the hard way when they attempted to wrangle an errant sheep last year in the village of Guester. Despite being pursued by patrol cars and K9 officers, the animal managed to elude authorities by hitting speeds nearing 30 miles an hour. When the animal was finally captured, police couldn't help but remark on just how fast he was: "It was not an easy pursuit. The animal had quite a turn of speed on it."